As with any industry as large as SEO, you’ll come across many different opinions about the most effective ways to approach site optimization. And though many of these tactics can work, and the idea of which is “best” is largely subjective, there’s one distinction you need to be aware of: White hat vs. black hat SEO. While some SEOs might paint these as two different schools of thought, they’re not so much equal categorizations as a right and a wrong way to do SEO. So in this page, we’ll get into the differences between white hat and black hat SEO, as well as the strategies involved in each, and a few white hat SEO examples. So if you want to know more, keep reading to learn about these different approaches to search engine optimization — and how to create a strategy that won’t put your business at risk. First, let’s take a look at the term “white hat” SEO. In short, it refers to the correct, ethical way to optimize a site. But to give you a more concrete idea of what means, a white hat strategy meets the following three criteria. The most widely-accepted definition of white hat SEO is that it follows Google’s Webmaster Guidelines. These are the rules that Google has laid out to define the proper way to optimize a site. And while they go into a bit of detail as to what an “ethical” SEO strategy looks like, they can essentially be summed up with one simple idea: Don’t be manipulative. So, in general, if you’re not attempting to manipulate rankings or otherwise deceive Google’s algorithm, you’re likely following their guidelines and using white hat SEO. White hat SEO involves making changes that are beneficial to a site’s visitors. And when you consider that Google’s top priority is to provide their users with the best possible results, it makes sense that this is an essential component of the “right” way to do SEO. Fortunately, many of the most effective SEO strategies already involve taking steps that improve the experience a site provides its visitors. Tactics like publishing high-quality content and improving page load times improve the value that users get from a site, and the ease with which they can navigate it — making them upstanding, Google-approved strategies. Strategies that follow Google’s guidelines and create a positive user experience are often more time- and work-intensive than black hat methods. This means that it will take time to see the results you want. But on the flip side, white hat SEO also has a much more lasting impact. That’s because when you use strategies that are designed to improve your overall site experience, you can achieve steady rankings for your target keywords. Since it involves investing in content that can generate results for years to come, and using tactics that don’t put you at risk for consequences from Google, white hat is a more long-term approach. Black hat SEO is essentially the exact opposite of white hat SEO. If a tactic meets the following criteria, it can be classified as black hat. Black hat tactics violate Google’s guidelines, and in many cases, are directly referenced in these guidelines as practices you shouldn’t use. While white hat SEO involves looking for ways to improve user experience, black hat SEO relies on manipulating Google’s algorithm to improve rankings. To put it simply, if a tactic is designed to make Google think that a site provides more value to users than it really does, it’s deceptive — and it’s black hat SEO. Many of the strategies involved in black hat SEO are focused on exploiting loopholes in Google’s algorithm that can lead to improvements in rankings without much work. And while some of these tactics can produce results, they’re almost always short-lived. That’s because Google is constantly improving its algorithm to provide the best results to searchers, and to prevent site owners who don’t provide a great site experience from ranking well. This means that sites using black hat strategies are at risk for losing their rankings every time there’s a new algorithm update — making this a much more short-term approach than white hat SEO. 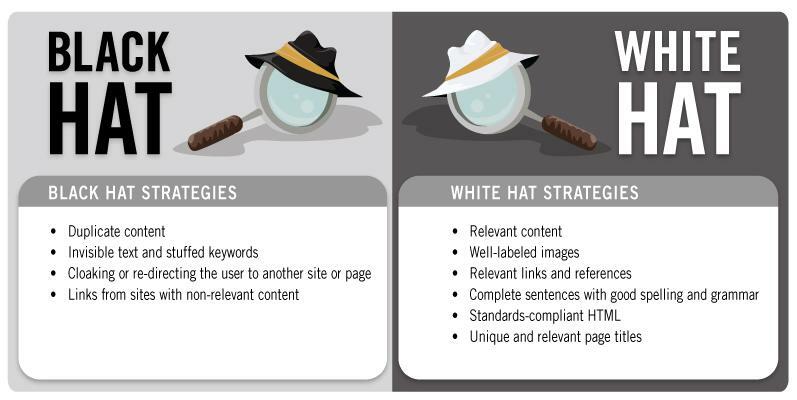 Black Hat vs White Hat SEO: What’s the Difference? The biggest differences between these two approaches are that white hat SEO follows Google’s guidelines and improves user experience, while black hat SEO violates those guidelines and is typically done with complete disregard for human users. Given that the core goals behind white hat and black hat SEO are very different, it should come as no surprise that there’s very little overlap in the specific tactics involved. Google also explains that site owners who uphold “the spirit of the basic principles” will see better rankings than those who use deceptive practices. So as long as you keep your visitors in mind as you work on your site and make changes with the goal of providing them with a better browsing experience, you can be confident that your SEO strategy is in line with Google’s guidelines. This means that tactics like writing high-quality, helpful content, increasing page speed, improving user experience, and working towards mobile-friendliness are all considered white hat — and are the types of changes that will have a lasting, positive impact on your rankings. While Google’s recommendations for the types of strategies you should be using are a bit general, and refer to the “spirit” behind the changes, they’re much more straightforward about the tactics you shouldn’t be using. If you’re using any of these tactics, you’re doing black hat SEO. That being said, it’s important to note that this isn’t necessarily a comprehensive list. So just because a tactic isn’t listed here doesn’t mean it’s safe to use. Although this is a less common term, you’ll sometimes hear SEOs refer to “grey hat” tactics. And as you may have guessed, this term is used to describe strategies that fall somewhere in between white hat and black hat SEO. In most cases, they could be considered manipulative, but Google hasn’t named them as practices to avoid. So while they might be less risky than the tactics Google has explicitly defined as bad, they still hold the potential for consequences. For example, tactics like creating doorway pages, building microsites, and submitting to link directories are all considered “grey hat.” You’ll occasionally come across debates about whether these are safe to use, or simply not worth the risk. Using tactics that attempt to manipulate Google’s algorithm has two possible consequences. Your site could be demoted in rankings due to an algorithm update, or manually penalized by Google. Google regularly updates its algorithm with the goal of improving the results it delivers to users. And many of these updates are designed to close the loopholes that black hat SEO exploits. For example, one of the most notable changes was the 2012 “Penguin” update that was designed to target sites buying links or using spammy link practices. When this update was released, thousands of site owners using deceptive link practices saw their rankings drop — and lost all of the results they’d gained through those practices. Since then, Google has released countless updates targeting manipulative SEO practices. So while these updates don’t target specific site owners or “ban” them from search results, they can have a serious impact on the rankings of sites using black hat tactics. Sites using black hat SEO are also at risk of a Manual Action from Google. These penalties are given by human reviewers from Google’s team and indicate that a site has been flagged for violating their guidelines. And unlike algorithm updates, manual actions can prevent sites from appearing in search results altogether. In this case, black hat tactics can have the exact opposite result from what the SEOs using them intend. Is Link Building Black Hat SEO? One common concern among site owners is whether link building is considered black hat SEO. After all, most site owners build links solely with the goal of improving rankings. They don’t impact user experience, and their main purpose is to improve a site’s credibility with search engines. So, does this mean you shouldn’t attempt to earn links to your site? Fortunately, the answer is no — but you should be careful about the tactics you use. As Google outlines in their guidelines, you shouldn’t participate in link schemes and affiliate programs that don’t provide value. And you should never attempt to buy links. But as long as you aren’t attempting to manipulate Google’s algorithm with spammy, unnatural links, taking steps to earn them is not an inherently black hat practice. White hat SEO takes time. It requires a significant amount of time, effort, and often money, to achieve significant results. As a result, you might be tempted to look for black hat shortcuts to speed up the process. But when it comes down to it, the risks simply aren’t worth the potential rewards. Invest in a white hat strategy, and you’ll be much more successful in the long term — without having to worry about algorithm updates or potential penalties. As you dig deeper into the world of digital marketing and the best ways to optimize your site, the black hat vs. white hat SEO debate is one you may come across often. And when you do, just remember that this isn’t a debate worth your time. White hat SEO is, point-blank, the better approach — and you shouldn’t listen to anyone who attempts to tell you otherwise. While black hat SEO may enable some site owners to achieve quick wins, it directly violates Google’s guidelines, relies on manipulative tactics, and is ultimately much more likely to lead to a penalty than the results you want. White hat SEO, on the other hand, follows search engine guidelines, focuses on a human audience, and takes a long-term approach — all of which are essential for making a lasting, positive impact on your search visibility. So with that in mind, you might be wondering what, exactly you can do to optimize your site in a way that has a positive impact. And if that’s the case, you can find the concrete strategies you’re looking for in our guides to on-page SEO and off-page SEO. How do you ensure that your SEO strategy is in line with white hat practices?